What political and social power structures can be read in modernist buildings in particular and how long is their maximum usability period? These and other far-reaching questions are examined by the Danish artist collective SUPERFLEX in "Modern Times Forever (Stora Enso Building, Helsinki)", a film and sculpture about the ‘Stora Enso’ headquarters designed by Alvar Aalto, in the heart of Helsinki. The result is a 240 hour-long film, the longest film ever made, which virtually documents the transformation of the building over the course of 5000 years in time-lapse animation. 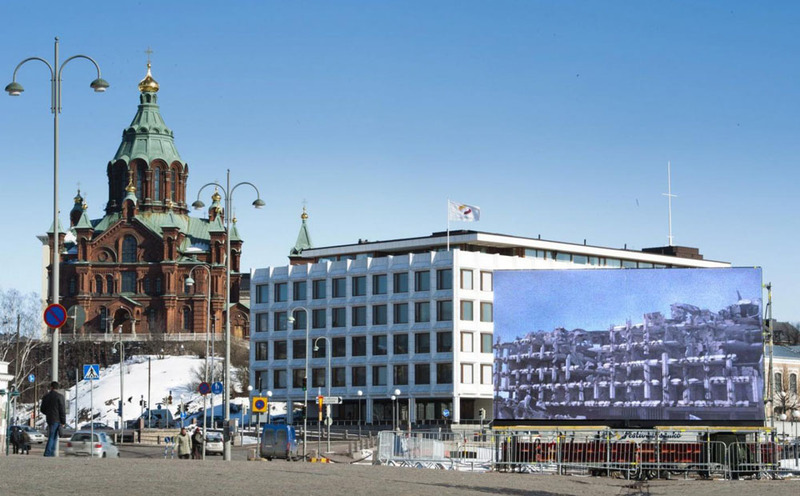 The film, commissioned by IHME, was shown over a ten day period of time in conjunction with the 2011 IHME Festival in Helsinki Market Square on a 40m2 LED screen, so that one could see the original building simultaneously with the building in the film. SUPERFLEX was founded in 1993 by the Danish artists Bjørnstjerne Christiansen, Jakob Fenger and Rasmus Nielsen. Their works have been shown internationally, for example at the Hirschhorn Museum and Sculpture Garden, Washington DC , the Museum of Modern Art, New York, and Louisiana Museum of Modern Art, Humlebæk. "Pro Arte Art Foundation Finland" produces an annual IHME Contemporary Art Festival, consisting of a commissioned work of art in a public space, as well as lectures, discussions e.a. The Foundation’s aim is to improve the relationship between visual art and the public while working international in scope. Yael Bartana is invited for the next IHME Project in 2014.